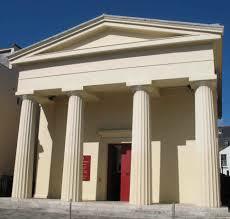 My wife and I were married three and a half years ago at the Unitarian Church in Brighton. We first really became aware of it as a building when watching Slow Club there as part of the Great Escape festival back in 2010, and when we began arranging our wedding the following year it was our first choice of venue. As an atheist, I did feel slightly uncomfortable at first about the idea of a church wedding, even though what little I knew about Unitarianism, and the Brighton church in particular, placed it very firmly on the liberal non-dogmatic side of religion.